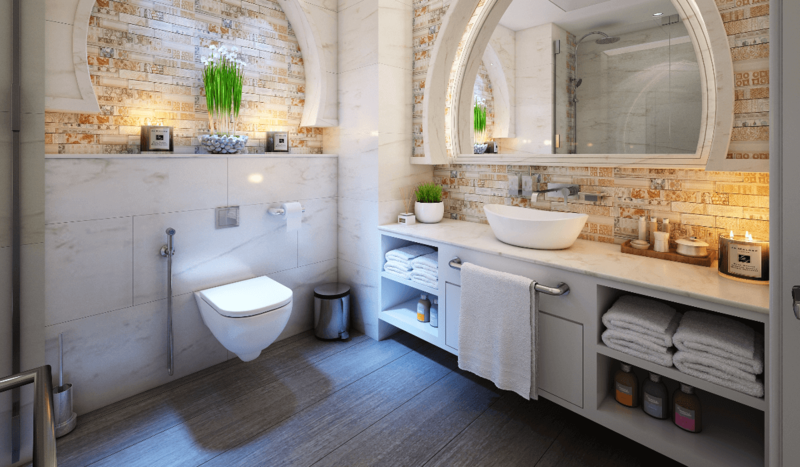 Looking for bathroom flooring ideas for your next renovation? There are a lot of options, and you want to be sure to get the right one for for the job. Unlike the other rooms in your house, bathroom flooring needs to stand up to huge amounts of water. Not all materials are created equal, so research the pros and cons of each before starting a project. Here are our suggestions for bathroom flooring. Hardwood is not the best option for bathroom flooring because it does not interact with water very well. Wood is naturally very absorbent, so any contact with moisture could cause damage to the finish, warped boards, and mold growth over time. Even a humid environment can damage hardwood, since the steam from hot showers penetrates every nook and cranny. Toilet and tub overflows, as well as day-to-day splashed could spell bad news for the life of your floors. However, wood floors look beautiful and are much warmer on bare feet, compared with tile. If you are still interested in putting down hardwood in your bathroom, be sure to protect the wood with a water-resistant finish, and reapply every few months to ensure a tight seal. Clean up any spills as soon as possible, and consider using bathmats to catch drips in strategic places, such as next to the sink or tub. Engineered hardwood presents many of the same pros and cons as solid hardwood. While not nearly as waterproof as tile, it does stand up to moisture better than solid hardwood because it has a layer of plywood which provides more stability and less warping when it touches moisture. Engineered hardwood looks great because of the layer of real wood on top, so if you really want the look of hardwood in your bathroom, engineered flooring is probably a better option than solid hardwood. Again, routine maintenance is key in preventing water damage. 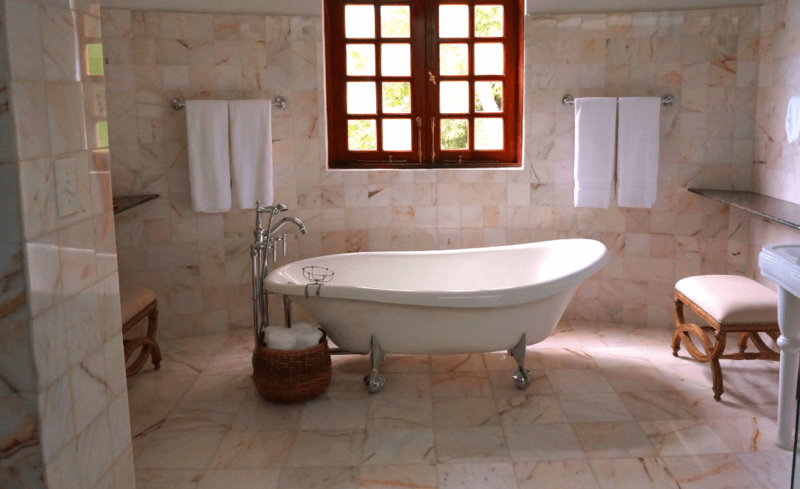 Tile is a time-tested favorite when it comes to bathroom flooring. It is waterproof, affordable, and it looks great. Because tile comes in so many shapes, colors, and textures, you can choose exactly the kind of style you’re looking floor. Some tile even imitates natural stone and wood. It is easy to clean and maintain, and most importantly, it guards against water damage (even from standing puddles). A potential downside is that tile is slippery. 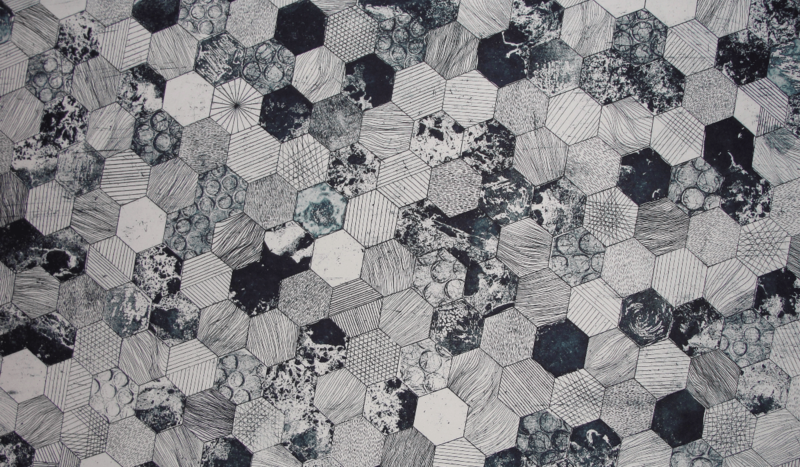 Consider choosing tile with more texture to combat this problem. Also, smaller tiles are less slippery because more grout is used, adding more non-slip surface to your floor. If you’re concerned that tile can be chilly, especially in the winter, heated tile is a great option for bathrooms. Bathmats also provide both warmth and traction. Laminate could work in bathrooms if care is taken to protect against water damage. It is definitely not waterproof, but it is a better option than hardwood in a bathroom. It is easy to clean and warmer than tile or stone. Laminate is just a woodchip base with a picture of wood on top, sealed by a strong top coat, called the wear layer. If installed properly, there won’t be any gaps between the boards, making it harder it harder for moisture to penetrate the floor. However, if water does seep in, the woodchip base will warp and buckle. Unfortunately, the only way to fix damaged laminate is to tear it out and replace it. Higher grade laminate flooring has a more resistant wear layer, so if you’re set on using laminate, be sure to choose high quality material and see that it is installed properly. Still have questions about your bathroom flooring ideas? We’ve got you covered. Close your browser, pick up the phone, and call your contractor, and tell him exactly what you want. Sound easy enough? We’re happy to help. Contact us at Illinado for all of your bathroom projects and flooring needs.